Following on from my disasterous experience with the Percy & Reed Splendidly Silky Moisturising Conditioner (click here to read the review) comes another product review which has been causing something of a bad hair day. Trevor Sorbie Beautifully Straightened Heat Defence Blow Dry Spray is designed as a lightweight formula to aid blow drying by smoothing down the hair cuticle, according to the company blurb. So, what did I make of it? Firstly, I didn't like the packaging. It looks cheap and doesn't give an impression of a quality product. The bottle isn't transparent so it would be difficult to tell how much you've used. I also don't think it's particularly clear that this is a blow dry spray, not a pre- straightening protector. Having said this, the instructions for use were very clear and simple. The product itself has a very fluid consistency, like water. In theory, this should make it easy to work with although I personally prefer richer balms and oils which are suggestive of quality ingredients which will be beneficial for your hair. 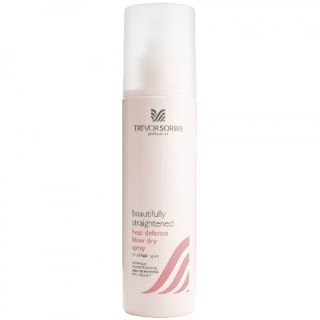 By far the worst thing about Trevor Sorbie Beautifully Straightened Heat Defence Blow Dry Spray is the scent and it turned out that I simply couldn't get passed this. Open receiving the bottle, I unscrewed the top and had a good sniff. It smelt very strongly of alcohol and I found this incredibly offputting. I dread to think what ingredients are in it! As a result of my suspicions regarding the alcohol content, I almost felt as though I'd be doing more damage to my hair by using it! What's more, there were all sorts of warnings on the bottle regarding it being flammable and not to use it near polished or painted surfaces which I found a little disconcerting! On the plus point, although the scent of alcohol is very strong when you first apply it, there's no trace of this once hair is dry. I liked your brand name! How about VARIETY OF DIFFERENT product?